New, beautifully built Hanalei home in cul-de-sac surrounded by plantation style lanai overlooking lush green tropical reserve and crystal-clear stream. Spacious great room and professional chef's kitchen encircled by granite bar and countertops that open to living and dining room. Ceiling fans throughout house. Great floor plan. Two bedrooms with king-sized beds and a third bedroom with twin beds that can be converted to a king-size bed as well. Pristine travertine marble in all three bathrooms: two full baths with bath tubs and showers, an additional half-bathroom and a beautiful private outdoor shower. Short walk to Hanalei Bay with two-mile white sand beach. Close to restaurants, outdoor market, shopping, and sightseeing. Perfect for families or couples looking for a vacation in Paradise! Amazing house, amazing location, a total gem! Joan’s house is perfectly located, amazing for a family trip, nice and spacious. Just a total delight and we would love to return! Thank you very much for your kind words Anne. We’re looking forward to welcoming you back again soon! Lovely house, clean and well kept. We hope to visit again in the future. Our favorite experience was eating breakfast or just relaxing in the backyard patio. Very serene. Thank you Andre! We’re so happy you enjoyed your stay in our Hanalei home! The pictures don't do this property justice. The interior is open and spacious with modern amenities. The wrap around porch is absolutely stunning. We stayed here with our family of 6 and everyone had plenty of room to spread out. The location is GREAT. It is literally less than minute walk from town and just 5 minutes down to the beach. Even though you are close to town the property is also very quiet (with the exception of Kauai's infamous roosters) because of the mini-jungle foliage and small stream that borders the backyard. The owner was very responsive in answering questions and following up with us to make sure our stay was good. Thanks very much Thomas. We're very happy to know you and your family had a great time in our Hanalei home! We would be delighted to welcome you back in the future! Somewhere between "I loved it!" and "Not really"
Tough one to rate as it could be a great property. We were disappointed with the cleanliness. The master toilet was didn't appear to be cleaned and the baseboards and door was dirty. The kitchen cabinets were sticky and most of the doors and light switches throughout the house were dirty with hand marks. We ended up wiping a lot of things down ourself. Also, for a house of this caliber and cost, you would expect everything to be working as advertised. The ceiling fan in the master had a broken blade so we were asked not to use it and instead there was a floor fan. We needed to keep the windows open to stay cool. In the owner notes it's recommended to keep fan on and windows closed so you can sleep.....ROOSTERS! I think the roosters live right outside the master's windows of this house, never before did they seem so loud. Needless to say we didn't sleep the best. The jets in both "jetted tubs" (as advertised) didn't work either.....With all that said, we love Hanalei, as this was our 8th trip there, so its hard to complain too much, but we were disappointed in this property and thought we would share. If the cleaning and upkeep were addressed this would be a fine property. We have a favorite property where we generally stay and hope for our next trip it is available. We're very sorry to learn about your concerns on our website rather than by phone or email while you were still in our home. It's extremely important to us that our guests are completely comfortable during their visits as you can see by our overwhelmingly positive guest reviews. I'm very surprised and disappointed that you didn't contact me while you were in our home, especially since we had exchanged several emails with questions you had prior to your arrival. Also, to be clear our jacuzzi-style tubs aren't described as 'jetted' tubs precisely because their jets aren't functional. Please know that we have a great, hard-working local team who look after our home and could have taken care of everything had we/they known about it. Hopefully you'll let your next host know right away if you discover something that needs to be addressed. - The traffic from the airport to Hanalei was pretty bad while we were there (especially through Kapa'a). Even the main road in Hanalei backs up due to the one car bridge separating the town and the Princeville development. Be prepared to sit in traffic, or just don't leave town. -The roosters are quite vocal so don't plan on sleeping in. We got used to them by the end of the week, but they are not shy. Nor are the cats, which my kids fed the entire week. I think it's charming, but maybe not everyone would. -We did the Smith Family Luau which was very good, but it requires you to drive quite a while, so you might be better off looking for something closeby. -We did a snorkeling/excursion from the South side of the island to explore Napali coast which was a life changer. We had an extraordinarily calm sunny day and were able to see a number of humpbacks up close frolicking near the Northwest side of the island. It was so calm they were able to bring the boat underneath a waterfall you could dunk your head in. It was insane. That said, I heard after the fact they run a catamaran tour right out of the North shore, so you might be better off doing that instead of driving the circumference of the island. However, we were able to see the Waimea Canyon from the boat which is breathtaking, which you wouldn't see if you leave from the North End. -Last note: DO NOT FORGET BUG SPRAY! The mosquitos are not like they are on the mainland. You don't hear them, see them or feel them. But if you don't protect yourself, they will eat you alive!!! Some were lucky in our group because the bugs didn't like them, but those of us that were on the menu, oh boy. I had dozens of bites up and down my legs that I still have bites marks from two weeks later. Learn from my mistake and your trip (and return) will be much more pleasant. Aloha! Thanks so much Matthew. We're always happy to hear from our guests and we're very glad to know you all enjoyed your vacation and our home too! 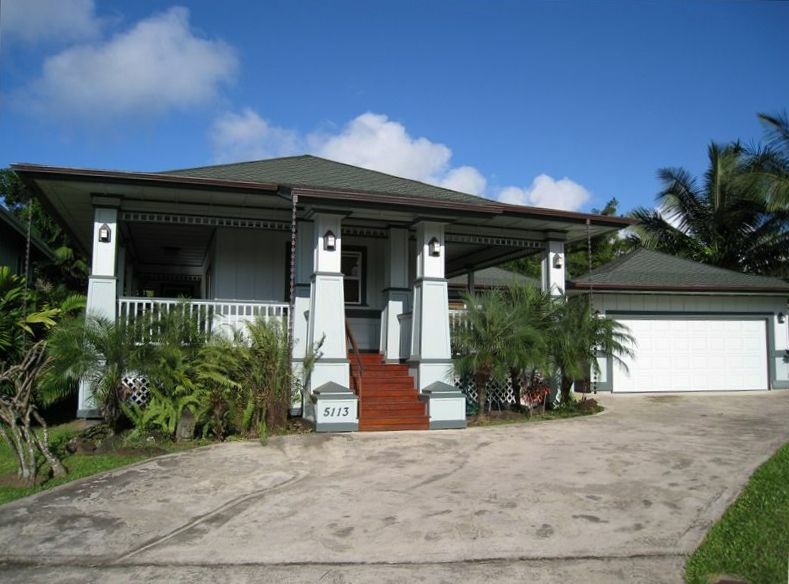 My wife and I have been coming to Hanalei for many years we absolutely love this house and the location. It is just a one minute walk to town with some of the best coffee shops and restaurants. You're also a five minute walk to Hanalei pavilion in the middle of Hanalei Bay. The house is well-equipped with an excellent kitchen and comfortable bedrooms. The backyard lanai is great for meals. There is very little rooster noise even in the morning and there are some friendly cats that hang around the property. The neighbors are very friendly as well. We will definitely come back with our family. Thank you very much for the wonderful feedback on your visit. We love sharing our home with guests like you who appreciate the beauty and charm of Hanalei. We're looking forward to welcoming and your family back in the future! Cancellation fee = 50% of rental fee if cancelled within 60 days of check-in date.